One of the things I love the most about cooking vegetarian food is that there is always some new ingredients to explore. Until I started to follow a largely vegetarian diet, I had never had or cooked with polenta. I am not even really sure that I knew that it was actually cornmeal. Yet, now I love the stuff. I dig how you can have it all mushy like porridge or if you let it sit for a bit it gets nice and solid but tastes just as yummy. When I saw this recipe over at Recipezaar, I knew I had to give it a try because I had never had polenta combined with parmesan cheese. For some reason, I have mostly kept it sweet. The recipe was posted by Sharon123, a Recipezaar regular who has tons and tons of very good vegetarian recipes amongst her collection. Really, she is the one that should be doing a vegetarian cooking blog! I wasn’t sure about some aspects of the recipe when I first read it. In particular, I wasn’t sure how the raisins would play with the other savoury ingredients. They really did work though to balance out all the rich tasting ingredients that went into the dish. A bit like how it is always nice to add a little something sweet to a curry to balance the spice. 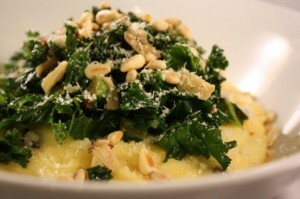 The original recipe – Polenta With Garlicky Greens – called for Swiss chard. I have never been able to find chard in any of the British supermarkets I visit unless it is as part of a pre-packaged salad bag and then only in very small amounts. I did, however, have some curly kale and so I used that instead and I have to say it was a good choice because the dark leafy green really carried the garlic very well. Truly, this is a great vegetarian comfort food dish and isn’t too dissimilar to eating a big batch of cheesey mashed potatoes topped with rich garlic greens. Mmm!